(July 27, 2011)--Representatives of the UTSA Office of P-20 Initiatives attended the United Way Volunteer of the Year Awards last month, where UTSA was nominated in the category of large business volunteers for its work in supporting numerous community organizations. Additionally, early in June, Communities in Schools-San Antonio (CIS-SA) named UTSA a Community Partner of the Year at their annual recognition event at Cafe College. Communities In Schools is the nation's leading dropout prevention organization, and for more than 25 years, CIS-SA has helped area students stay in school. At the event, CIS-SA officials spotlighted their collaborative programs with UTSA Athletics, the UTSA College of Education and Human Development and the UTSA Office of P-20 Initiatives. The Office of P-20 Initiatives works closely with CIS-SA on the Rowdy Reader program, which focuses on the importance of reading in elementary and middle school. Children participating in the program are required to read a designated number of books. The program also provides participating students with an opportunity to tour UTSA and attend a UTSA athletics event. 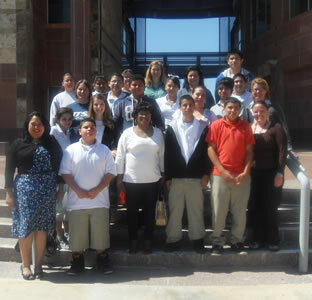 In April 2011, UTSA received recognition from the Big Brothers Big Sisters organization for participation in the Mentoring Matters program, facilitated at UTSA by the Office of P20 Initiatives. Launched by the mayor's office, Mentoring Matters connects youths to careers, beginning as early as seventh grade and continuing through high school. It is a collaborative program between area businesses, the City of San Antonio and area nonprofits such as Big Brothers Big Sisters and Communities in Schools-SA. In the fall and spring, UTSA faculty and staff mentors worked during lunches with students from Twain Middle School at the UTSA Downtown Campus to serve as advocates and guides through the college and career exploration process. Kristina Talamantez in the College of Education and Human Development COEHD graduate studies office was one of the many UTSA mentors who made a positive impact on a middle school mentee, according to a middle school counselor. Twain students and their UTSA mentors ended the school year with a visit to Cafe College, a resource center in downtown San Antonio that provides information on careers and how to apply to colleges and universities. "Community engagement and public service are key components of the UTSA mission," said Belinda Saldana, director of community outreach in the Office of P-20 Initiatives. "We are pleased to partner with many great organizations such as CIS-SA and BBBS and work alongside them to help students be successful in school and strengthen our community." According to Saldana, CIS-SA needs 400 mentors as part of their Middle School Partners program, which helps students "catch up on course work" to get back on track for high school. Additionally, BBBS is interested in hearing from other UTSA faculty and staff members who would like to be mentors in the Mentoring Matters program at UTSA. For more information, contact Belinda Saldana at 210-458-2904.